Several months ago I published a feature article about Augmented Humanity and the consequences of Cyborg implants in human beings. Ben from Madman Entertainment read the article and sent me a DVD of Ghost in the Shell 2.0 to review because he said it was an excellent examination of what the future could be like if many humans become cyborgs. Cyborg definitions – 1: A cybernetic organism; 2: A reconstructed person capable of exceptional physical feats via replaced or augmented human parts. Western Animated movies are targeted at children or generally at all ages. On the other hand many Japanese animated films (Anime) are meant for adults. As much as I like Disney/Pixar films, you won’t find any of them addressing serious topics like cyborgs and the nature/essence of humanity. Ghost in the Shell 2.0 is a beautifully Anime (Japanese animation) film that highlights potential future issues with cybernetics/cyborg humanmachine implants and served as an inspiration for the Wachowski brothers when they created the Matrix movie trilogy. 2.0 in the title signals that the original film which was released in 1995 has been remastered for DVD and Bluray as well as having significant improvements to shading and other aspects of it’s cell animation using new CGI techniques. The story is centred around Major Motoko Kusanagi, a cyborg who works for Section 9 of the Japanese National Public Safety Commission. Motoko and her colleague Batou are assigned to hunt down a rogue AI called The Puppet Master. The movie asks more questions than it answers, leaving watchers to wonder whether someone with a human brain and cyborg body should be treated both legally and personally like any other human being? What about a disembodied human intelligence? What is a human? A soul? … Memories? … Feelings? … Consciousness? “Humanity has underestimated the consequences of computerization” -The Puppet Master. I prefer to watch foreign language films with their original native language voice actors and English subtitles because English dubbing choice of actors is often horrible. The English dubbed voice actors for Ghost in the Shell are not as bad as those in anime film Ponyo (which is otherwise a great film) but I agree with the Guardian film reviewer Andrew Pulver that Ghost in the Shell 2.0 is “hamstrung by the awful English-language track.” I recommend listening to the Japanese sound track throughout the whole film and reading the captions in English. I have excerpted two scenes in the movie that are crucial to understanding the existential/philosophical issues faced by a cyborg pondering the nature of humanity. “If a technological feature is possible, man will do it. Almost as if its wired into the core of our being. Metabolic control, enhanced sensory perception, improved reflexes and muscle capacity. Vastly increased data processing speed and capacity. All improvements thanks to our cyber-brains and cyborg bodies. So what if we can’t live without high level maintenance? We have nothing to complain about. We do have the right to resign if we choose. Provided we give the government back our cyborg shells and the memories they hold. Just as there are many parts needed to make a human human …there’s a remarkable number needed to make an individual what they are. A face to distinguish yourself from others. A voice you aren’t aware of yourself. The hand you see when you awaken. The memories of childhood, the feelings for the future. 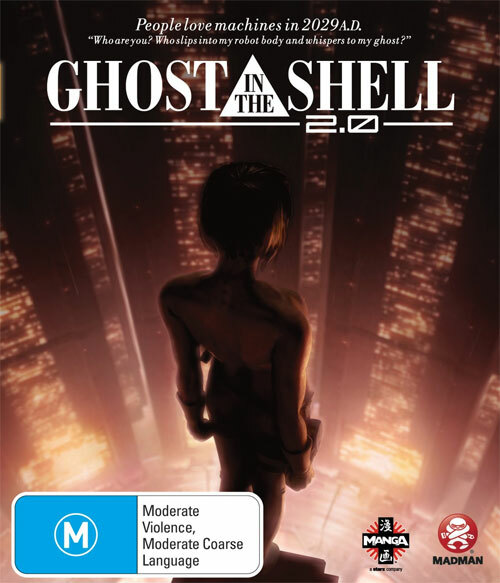 Ghost in the Shell 2.0 can be purchased from Madman Entertainment (Australia’s leading distributor of Anime and other special interest genres) in DVD or Bluray format. I love to watch anim movies.. I have several on my HDD like How to train Dragon, Up, Kungfu Panda, etc. THey are all awesome. Now as per you reviews it seems to be interesting. I will watch this movie..but i dnt understand japanese..haha..will try to get english or hindi version..! Pretty sure Ghost in the Shell 2.0 (Innocence) is a completely different movie than Ghost in the Shell. Unfortunately just to matters really confusing there is a remastered version of GITS 1, called GITS 2 in some countries.